Anyway, yesterday I gave you this little gem of a pesto recipe, which I use all the time. You could double or tripple this and freeze little batches of this, then pull it out whenever you’d like and stir it into yummy things! Because pesto stirred into yummy things makes them yummier. So there. If you want to see the original post with some pesto-makin’ hints, click here. Easy stuff, kids! 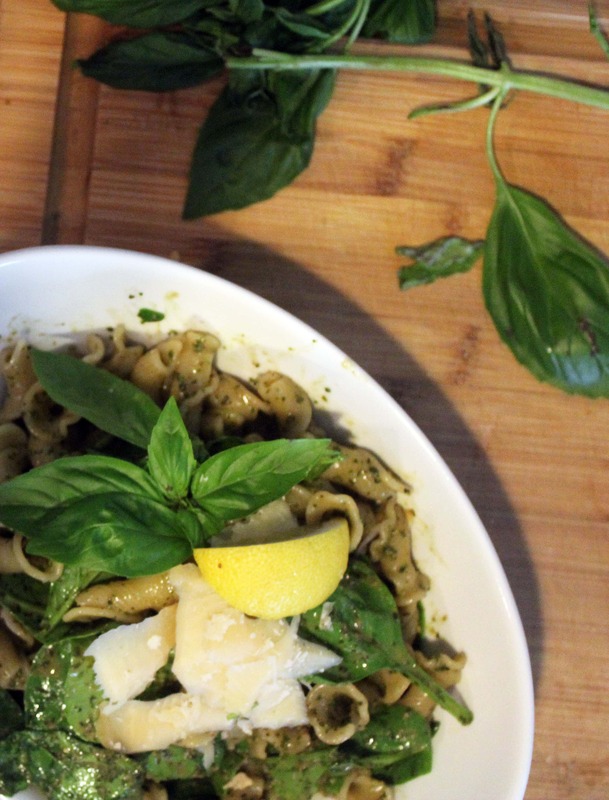 Now, you can make the pesto way in advance. Like, a week. Or a year and freeze it. Whatever. The key is to toss the pesto with the spinach all at once and serve it quickly so the spinach wilts but doesn’t cook too much. While the pasta is cooking, put 1 tablespoon of pesto PER SERVING (plus a little extra for good luck) in the bottom of a large bowl. 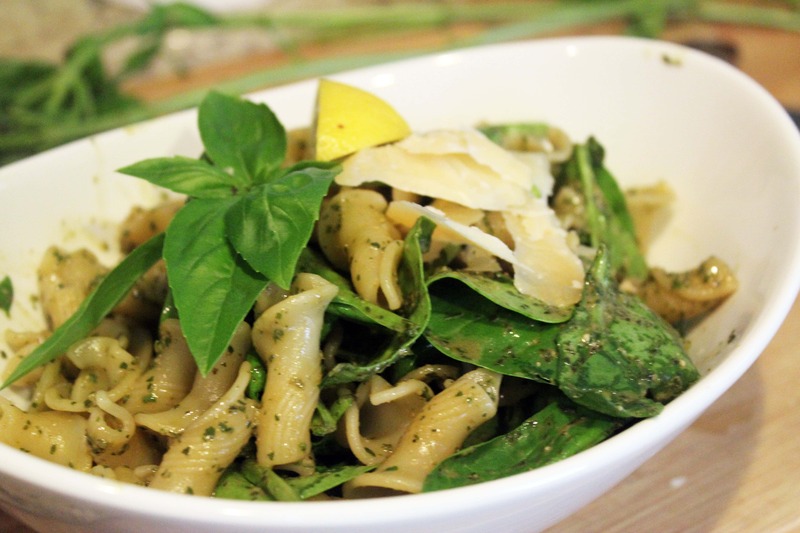 When the pasta is one minute away from being cooked, add a cup or so of the pasta water to the pesto to warm it up. Reserve another cup of pasta water too, just in case. The deal with the pasta water, here, kids, is that it’s full of starch and salt because you salted your water like a good cook before you started cooking the pasta. So, it tastes like salt and water and pasta! Yum. By grabbing it from the pot right as the pasta is finishing cooking, we ensure that the water has the most starch it can. Anyway. 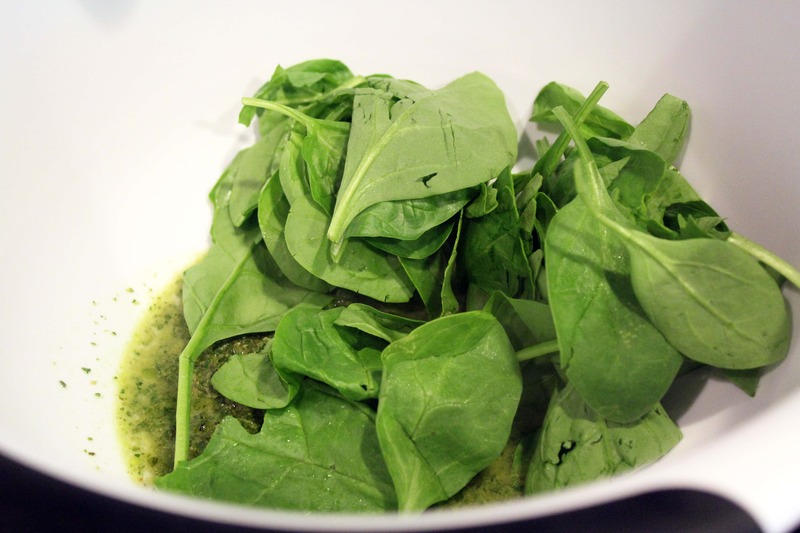 Toss the spinach on top of the pesto and hot water – it’ll start to warm up soon! 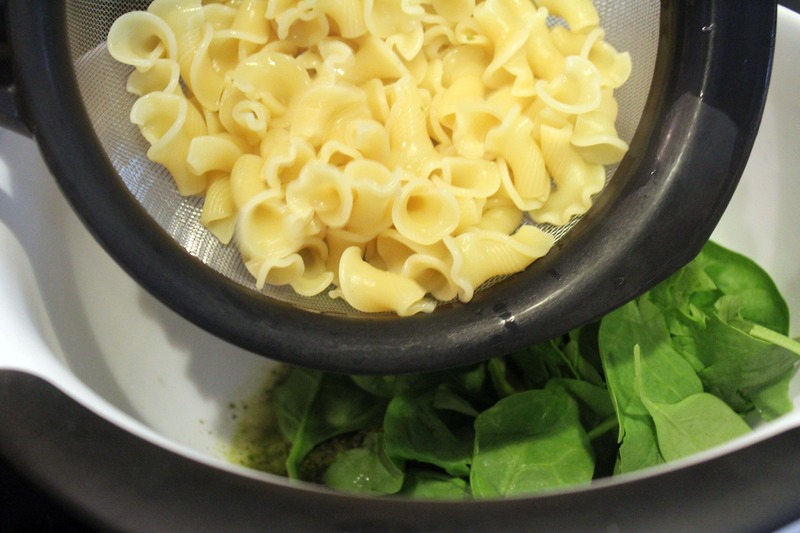 Then, drain the pasta and immediately dump it on top of the spinach while it’s still super hot so it can help the spinach to wilt a little bit. Like men do, when you tell them they’re terrible at cleaning. 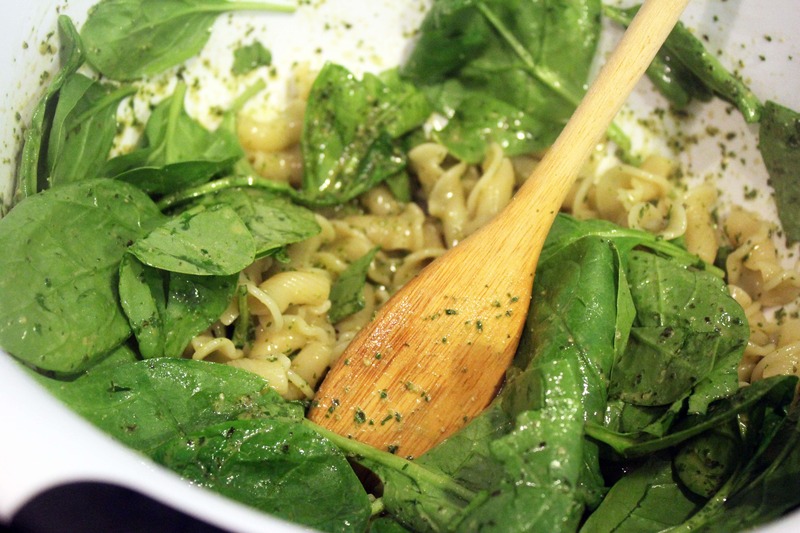 Stir the pasta, spinach, pasta water, and pesto around for 1 minute to combine everything and allow the spinach to wilt. Taste it, and add some salt or more pesto if you’d like! That’s it, folks. Serve this with parmesan and extra lemon and basil. Easy, fresh, and so delicious. For variations on this theme, you could add other chopped blanched veggies, extra pine nuts, sliced grilled chicken…..whatever you like! 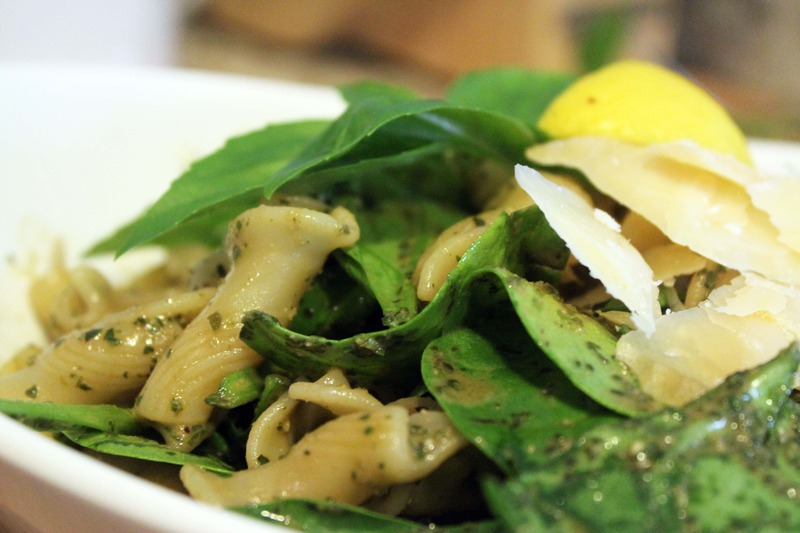 One of the best Pasta with Spinach recipes, keep posting! Thanks! 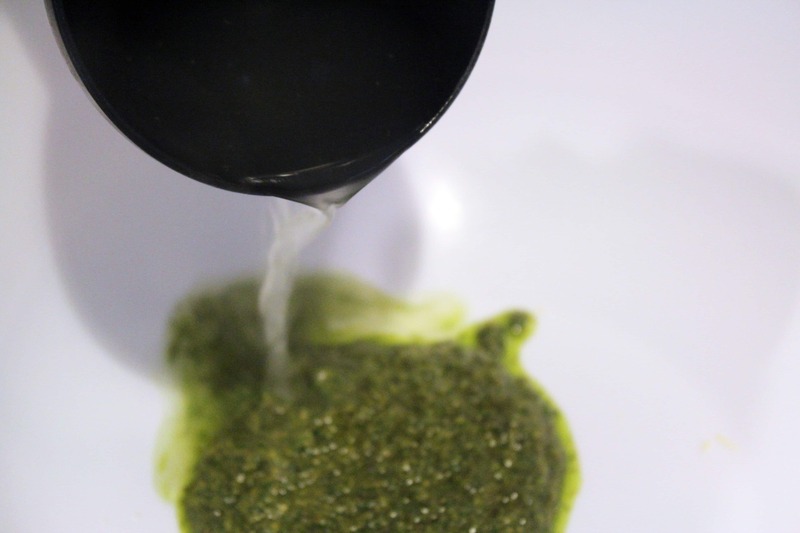 I love it, and it’s so nice to just keep pesto around all the time and use it in various ways. Enjoy!